Tonight’s GOP debate, co-sponsored by my own institution, the American Enterprise Institute, and the Heritage Foundation, will be focused on foreign policy, and, as is the nature of such events, the journalists moderating it will likely pose a lot of softball questions, with almost no follow-up and nothing that really cuts to the core. Here’s a list of questions that I would love to hear answers to (and I imagine many primary voters would, too), but that almost certainly won’t get asked in the dozen primary debates scheduled in the weeks ahead. But a guy can dream, right? TO NEWT GINGRICH: In a recent debate you called for the imprisonment of Barney Frank and Chris Dodd for their longtime support for and involvement with Freddie Mac and Fanny Mae. Since you got paid at least $1.6 million by Freddie Mac from 1999 to 2006, what prison sentence should you receive? TO HERMAN CAIN: In 2008, Hillary Clinton ran a campaign commercial about the 3 am phone call to the president informing him or her of a major crisis, and asking which candidate Americans want answering that phone call. Your campaign excused your fumbling answer about Libya at an editorial board meeting by saying you were operating on four hours of sleep. If President Cain were woken up in the White House by his National Security Adviser after less than four hours of sleep, would you take the phone call, or tell him to call you back at 10 am when you were rested? TO MITT ROMNEY: You have said your first act as president would be to give blanket waivers to all 50 states from the Affordable Care Act. Blanket waivers without specific reasons and without appropriate administrative procedures would directly circumvent the law—laws that you would have sworn to faithfully executive if you become president. Please explain why suchs waivers would not be a violation of your oath of office. 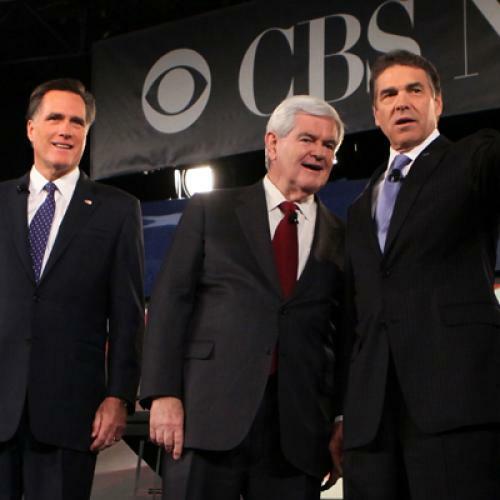 TO RICK PERRY, NEWT GINGRICH AND MITT ROMNEY: You all harshly criticized President Obama’s policy towards Iran, and said you would vigorously pursue covert actions like assassinating nuclear scientists and subverting the Iranian nuclear program. The dictionary definition of covert is: “concealed, secret, disguised.” Do you find it problematic that you have just overtly declared your covert policies? TO NEWT GINGRICH: You have said that if Americans want a competent manager as president, they should choose Mitt Romney, and if they want revolutionary change, they should choose you. Do you believe that being an incompetent manager is a good qualification to be president? TO MICHELE BACHMANN: You recently denounced former President George W. Bush for pursuing socialist policies. Can you name three presidents in your lifetime who did not pursue socialist policies? TO MITT ROMNEY: The Senate Republican jobs plan includes elements you highlight in your own economic plan—freezing regulations, enacting a balanced budget amendment, repealing health care reform. Independent economists say almost uniformly that this plan will not create a single job in the short-term, while the Obama jobs plan will create almost two million jobs. What would you do to create jobs now? TO RICK PERRY: Governor, your own budget office projects a deficit for the next two years of up to $23 billion. Texas courts have said the state has a structural deficit of up to $10 billion because you are violating the state constitution by underfunding education. You avoided a deficit this year through accounting techniques and gimmicks. How do you account for these burgeoning deficits and what will you do about them? FOLLOW UP: You have called for members of Congress to forego their pay if they do not balance the federal budget. If Texas does not balance its budget next year without gimmicks or chicanery, will you give back your governor’s salary? TO HERMAN CAIN: Steve Pearlstein, an economics columnist at The Washington Post, recently explained how you and other investors purchased Godfather’s Pizza from Pillsbury in a leveraged buyout, only to subsequently close many restaurants, fire many employees, and put the rest largely on minimum wages jobs with no health or pension benefits. Is this the model you would apply to create jobs for the country? TO MITT ROMNEY: How, if at all, does Herman Cain’s leveraged buyout of Godfather’s Pizza differ from the model you developed at Bain Capital? TO RON PAUL: Congressman, your budget plan would immediately slash $1 trillion from government spending, during a weak economy. Even conservative economists say that would cause huge immediate damage to the economy. How would you avoid that immediate damage? TO HERMAN CAIN: You have said you don’t know and don’t need to know the details of policy, that you would bring the best people in to advise you as president. Your campaign manager, Mark Block, has been accused of voter suppression in Wisconsin, was barred for three years from participating in any campaigns in the state for his campaign chicanery, has tax liens from the IRS, drunk driving convictions, and now faces allegations that he set up a charitable organization that illegally used tax-exempt funds to help your campaign. Is this the sort of person you would call on to advise you in the White House?